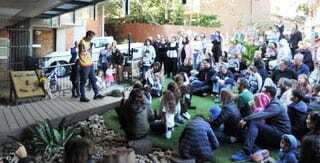 Over 250 people attended the official opening of Sydney’s new Emanuel Woollahra Preschool facility yesterday. The guests included many past teachers, directors and families who still hold a special place in their hearts for their old preschool. As a part of the formalities, we had Tim Ella, an aboriginal elder from the Yuin Clan in the Durawell land, who performed a smoking ceremony and did a welcome to country. Tim spoke about the meaning behind the word “Woollahra” meaning “look out”. Accompanied on key board, guitar and violin by parents of the preschool, the children then came together to perform songs from the Torres Strait Islands (Taba Naba) west Africa (Fungi Alafia) and Israel (Od Yaho Shalom Aleinu). This was followed by one of our preschool fathers who performed his own rendition of a Fiddler of the Roof medley singing “to life to life Lechaim and “wonder of wonders”. The afternoon concluded with a mezuzah ceremony conducted by Rabbi Kamins. Original plaques were placed back up on the newly created wall called ‘The Once Upon A Time Wall’, to remember and record memories and donors from the past 64 years of Emanuel Woollahra Preschool’s life. The event was felt with immense warmth and joy marking a truly historic moment in Sydney’s Jewish community.